My 3x-great grandmother Hannah Andrews has been a mystery that I have been working on since I started genealogy. I am related to her in the following way: my grandmother Edna May (Darling) Baldwin, her father Russell Earl Darling, his mother Emma (Lamphere) Darling, her mother Hannah (Andrews) Lamphere. Hannah married Russell Lamphere in Colchester, Connecticut in 1838, and was “of Ashford” Connecticut. She had a brother, Alden, that she must have been close to; they were frequently neighbors before she left Connecticut, Alden named his first son after her husband, and even after Hannah’s death, her husband took in another of Alden’s sons and got him a job in the mill where he was a supervisor. The birthplace of both Hannah and Alden was usually cited as Massachusetts or, sometimes, Connecticut. Based on census ages, I would estimate Alden was born in 1817 and Hannah in 1819. I found names for Hannah’s (and Alden’s) parents in Hannah’s 1878 Providence death record, “Jesse and Sarah Andrews”. Alden’s 1873 death record in Coventry, Rhode Island lists his father as Jesse, and no name for the mother. Hannah named her first daughter Sarah. Obviously, I carefully examined the Ashford, Connecticut census records for Jesse Andrews. I thought he should be there in 1840, since Hannah had just married in 1838. But there was no Jesse in 1840. In 1820, there was a large household headed by Jesse. In 1830, there was a household of an older couple, headed by Jesse. There was nothing prior to 1820. All this seemed wrong for a household that Hannah and Alden could have been born into in the late 1810’s. Plus, Hannah and Andrew may have been born in Massachusetts, according to various census records. I never noticed any sign of other siblings, so I suspected Hannah and Alden were NOT part of this large family from the 1820 census … perhaps they were orphans from a nearby section of Massachusetts, living with relatives in Ashford. Although Jesse Andrews is an unusual name, it is far from unique. I eliminated several Jesse Andrews for various reasons. There were actually two couples names Jesse and Sarah Andrews – one in Montague, Massachusetts, married around 1817, who unfortunately had too many documented children during the years Hannah and Alden could have been born (plus, they never left Montague). So not them. There was one other couple, Jesse Andrews and Sally Arnold, married in Warwick, Rhode Island in 1795. I considered them, but they seemed too old, and I found them in the 1800 and 1810 Rhode Island federal census with a growing family. I knew that the correct Jesse and Sarah Andrews might be poorly documented (after all, I have never found birth records for Alden and Hannah), so I suspected the real couple was still unknown to me, and kept looking. 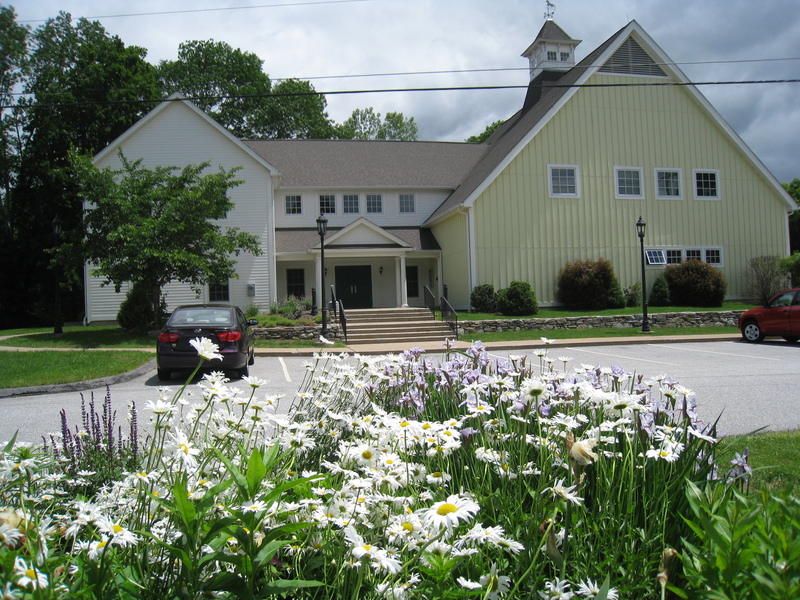 I visited the town hall of Ashford, Connecticut to look at deeds. The town hall also contains probate records, and more information about cemeteries than one usually sees, although I found nothing relevant in probate or cemetery records. But I was thrilled to spot an 1838 deed where Jesse Andrews was the seller and Alden Andrews was the buyer, plus the 1832 deed for the same property where Jesse made a purchase which was mortgaged to the seller. The heavily mortgaged property was finally sold, by Alden, to neighbor Amos Weeks by 1839. I photographed and abstracted the deeds. Ashford Deeds. Jesse’s transactions in green, Alden’s in blue. With new assurance that Jesse had at some point lived in Ashford, I reexamined the Ashford census records, page by page. I realized that when I concluded the Jesse in 1820 could NOT be the right one, I had also dismissed the next name in the 1830 census – next to the older Jesse and wife – Benjamin Andrews. Now, I carefully researched Benjamin. He was born around 1809, 10 years before Hannah and Alden. I was surprised to find, in the 1850 census, that he was living with his widowed mother Sarah and his children. He remarried in 1853 to Mary Ann Davis, of Norwich Town, and went to live there. In the 1860 census, Sarah seems to be mis-recorded as “Anna” Andrews, but in the 1861 city directory she is reported as living at 22 Spring Street, which is the home of Benjamin. The most surprising part of these records? Benjamin and his mother Sarah were born in Rhode Island. Suddenly, the Warwick, Rhode Island couple Jesse and Sarah Andrews seemed like a stronger possibility. 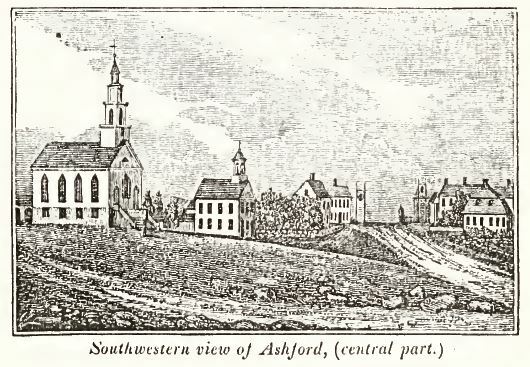 Could they have lived in Rhode Island for a while after their marriage, had a large family, then moved on to Ashford Connecticut (possibly living in Massachusetts briefly, in between) around 1818? Were Alden and Hannah the last in a long string of children? I turned my attention to the record of Jesse Andrews and Sally Arnold who married in 1795 in Warwick, Rhode Island. It was very informative, giving a name for both fathers and mentioning that one was deceased. I needed to learn more about them, to see if it was possible they did move out of Rhode Island. Rhode Island vital records compiled by James Arnold. Volume 1 covers both Warwick and East Greenwich. Census records including 1790, 1800, 1810, 1820, 1830, 1840, 1850, 1860 plus some earlier state census records for the fathers. Rhode Island Roots, the journal of the Rhode Island Genealogical Society. The Narragansett Historical Register, published by James N Arnold in the late 1800’s, vol 1-9. The Rhode Island Genealogical Register, 1978-1996, v. 1 – 20, particularly the Will Index, v. 16. 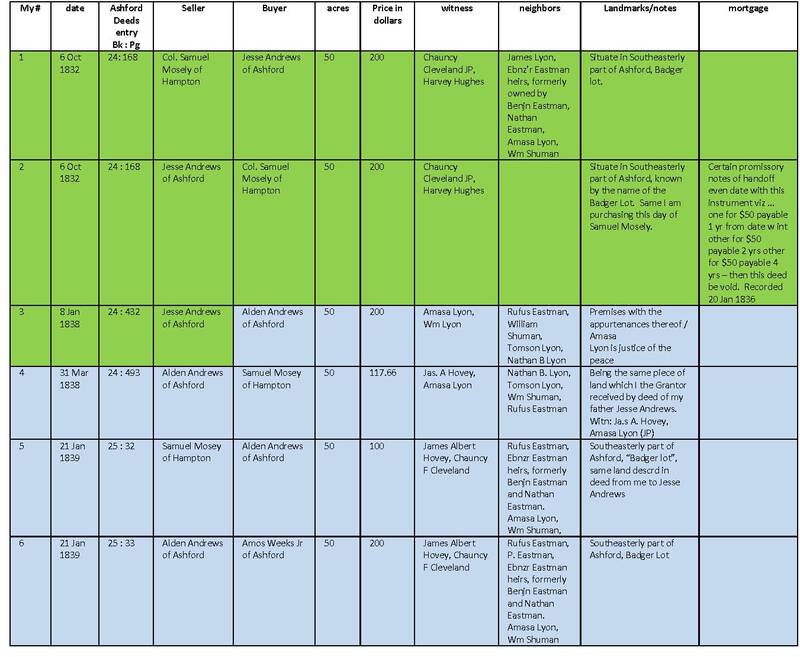 A thorough search (one major category at a time) of Ancestry.com, plus Fold3.com, FamilySearch.org, NEHGS website, and GenealogyBank.com. A visit to the Rhode Island Historical Society Library and perusal of their card catalog, manuscript collection, and various books. The 1810 census, in Warwick, shows Jesse with a household of 2 adults and 7 children living in Warwick, near Joseph Arnold, and Freelove Andrew, who may by his widowed sister in law or possibly his widowed mother. First of all, other than the marriage for Jesse and Sally, there are few vital records for this group. That’s not very unusual in Rhode Island. I am also still seeking some Connecticut death records that may turn up in Hartford when I visit later this summer. Jesse Andrews and Sally Arnold were from old Rhode Island families. And a search showed that Jesse Andrews no longer appeared in Rhode Island census records after 1810.
a “Register of Seamen’s Protection Certificates from the Providence, Rhode Island Customs District, 1796-1870” record for Jesse dated Dec. 4, 1798 (“age 32, light complexion, Place of birth: Warwick, R.I.”) I found this as an Ancestry.com Military record; the source of the data was a book “Register of Seamen’s Protection Certificates from the Providence, Rhode Island Customs District, 1796-1870. Baltimore, MD, USA: Genealogical Publishing Co., 1995.” Interesting. Of all my Rhode Island/Massachusetts ancestors, none so far have been connected to the sea. Only my father’s Nova Scotia side has that. For an explanation of Seaman’s Certificates, visit this Archives.com page by noted genealogist Kathleen Brandt. I wonder if Jesse followed that career for a while, or quickly switched to farming? Jesse was born in 1766 to Phillip and (unknown) Andrews. The Rhode Island Historical Society had a three-volume manuscript on the Rhode Island Andrews family that Jesse was from. This is a good example of a document not digitized or available elsewhere. The first immigrant was John McAndrews (sometimes Andrews) from Scotland who first settled on Cape Cod, but was in Rhode Island by 1671 as an original participant in the “Fones Purchase” in North Kingstown, Rhode Island. My line of his descendants settled in nearby East Greenwich, Rhode Island, and Jesse’s father, Phillip, ended up in Warwick. 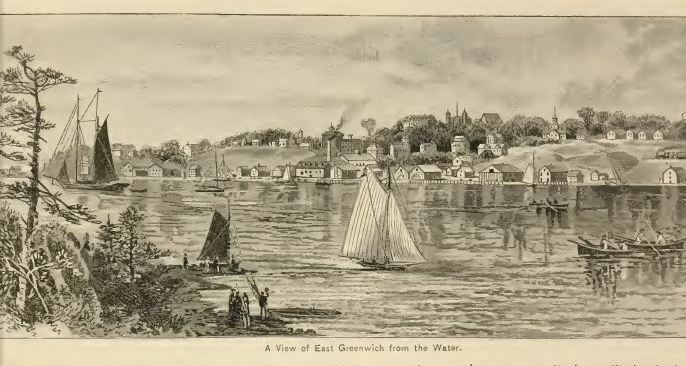 East Greenwich, view from the water. From Wilfred Munro’s Picturesque Rhode Island, 1887, p. 241. Notably, Jesse had a grandmother named Hannah. Hannah’s name was a little old-fashioned for 1819, so I always thought she was named for an ancestor. There are two Arnold families in Rhode Island, the Thomas Arnold family of Smithfield, (from which I am also descended), and then Sally’s family, which is likely to be the William Arnold family of Providence/Pawtuxet/Warwick. Descendants of William Arnold are related to Benedict Arnold, the first Rhode Island Governor, and his great-grandson, the Revolutionary War traitor by the same name. I am having trouble placing Sally and her father, Joseph, in that family because there are so many Joseph Arnolds in and around Warwick in this period. Warwick deeds may help that. In 1810 Jesse was living with a family of 9 near Freelove Andrews (which was the name of his brother Christopher’s wife, but I wonder if it could possibly be his mother) and Joseph Arnold (likely his father in law). In 1820 Jesse Andrews had a family of 11 in Ashford, CT. My goal now is to see if I can find proof against the theory that this is the same person, or possibly some further evidence to support it. why were Jesse and Sarah living alone in 1830, if they still had two growing children, Alden and Hannah? Benjamin and his wife also lived alone. The births of none of the children are recorded in Rhode Island or Connecticut, so I’m not yet sure who the siblings are – did one take Alden and Hannah over the border into Massachusetts for a while, to live? The parents were quite old. Why name a child Alden when I see no evidence of that family connection in the backgrounds of Jesse and Sarah? I am only slightly troubled by Sarah (if it is her) being called Sally in the marriage record and yet was never called that in later documentation. She was young at the time of her marriage and may have outgrown the nickname. Siblings Benjamin, Alden and Hannah used the following in naming for their own children: Griggs, Norriss, Merrill, Vernon. So far, none appear among these Rhode Island relatives. If the Jesse and Sally from Warwick theory proves to be a dead end, I have one more theory. Alden Andrews moved many times, always working as a farmer until a stroke at age 56 ended his life. He ended up living in Rhode Island just over the border from Connecticut in Summit Hill, Coventry. There are many Andrews around there. I am finding no evidence that his father Jesse was from there, but I will keep looking. Visit the Warwick town hall to explore deeds for Jesse and his father, Phillip, who had died before 1795. In particular, look for evidence that Jesse was leaving town sometime in the 1810’s. Also explore deeds in Warwick for Joseph Arnold, Sally’s father. Try to find a Rhode Island Andrews or Arnold connection among the neighbors in Ashford, Connecticut. If anything, there seem to be more Arnolds. Try using the Massachusetts Deeds on FamilySearch.org to help me locate Jesse in a nearby Massachusetts town around 1817. It’s fun to see your thought process and investigation techniques. Hope it all comes together! Thanks so much for the mention. Looking forward to the continuation. Thanks, Kathleeen. I loved your discussion of the Seaman’s documents. This area is really new to me.